Today Holy Mother Church remembers St. Medard, who died in 558. He was a Frenchman, ordained at 33. Story has it that he was, as a child, once sheltered from a serious rainstorm by an eagle’s wings. 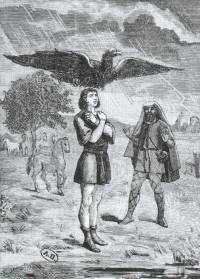 Tradition has it that if it rains on his feast day, the next forty days will also have rain. But if the weather is good, it will also be good for forty days. So, fittingly, he is the patron saint of good weather. He is also the patron saint of people with toothaches. St. Medard laughed often, and he would also do so with his mouth wide open, allowing a good view of what many thought were nearly perfect teeth. Before many did, he believed and preached that laughter is the best medicine. It must have worked, too, because the man lived to be 90. Well…it's suposed to rain here where I'm at…the news said something about severe weather…hopefully the next 40 days will not follow suit…. I might laugh all the time too if I had a funny story like a giant eagle protecting me from the rain.